Flames, Flips And Flying Fragments Feed Florida Frenzy. 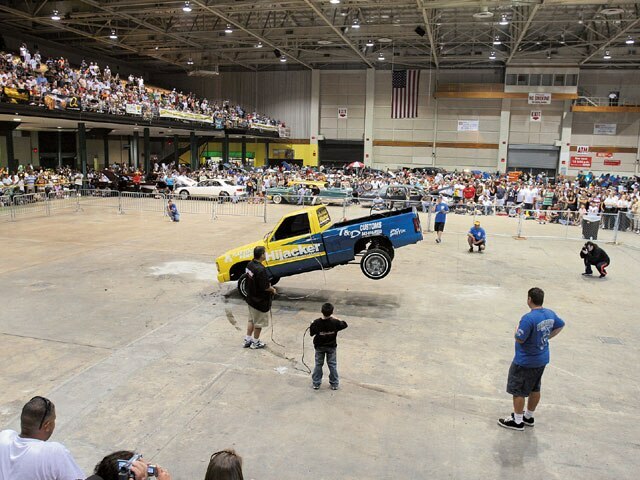 The third stop on the 2007 30th Anniversary Tour saw some flame-throwing, top-flipping action at the Fairgrounds in Tampa, Florida. With more than 25 entrant vying for their place at the Super Show in October, quite a few contestants let their intentions be known. First up was the Single-Pump Hop and it proved an interesting configuration. Five cars went in, three came out victorious and two of the three were in First Place. Eduardo in an ’89 Cadillac and Jose Bernal in his silver ’88 Chevy Monte Carlo both hit 33 inches to tie for First. Lorenzo Gonzalez’ 21 inches was good for Third. Double-Pump Hop action saw Frank Carralero of Red’s Miami hit 48 inches with his baby blue ’63 Chevy Impala, good for First Place. Oscar Flores’ ’86 Olds Cutlass was 2 inches short of that for Second and Kevin Herman was another 2 inches shorter for a Third Place finish. 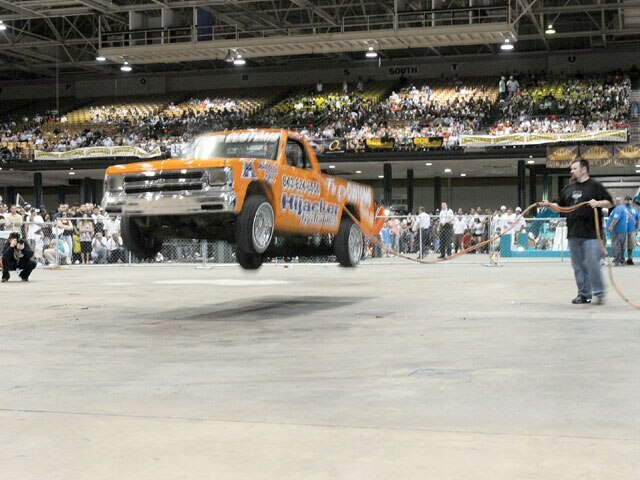 The Truck Hop wasn’t quite as close a race, but still had some exciting action. When it was all said and done, Bryan at the switches of the CCE Hydraulics ’91 Mazda soared the front wheels 84 inches for First Place and the current Tour record. 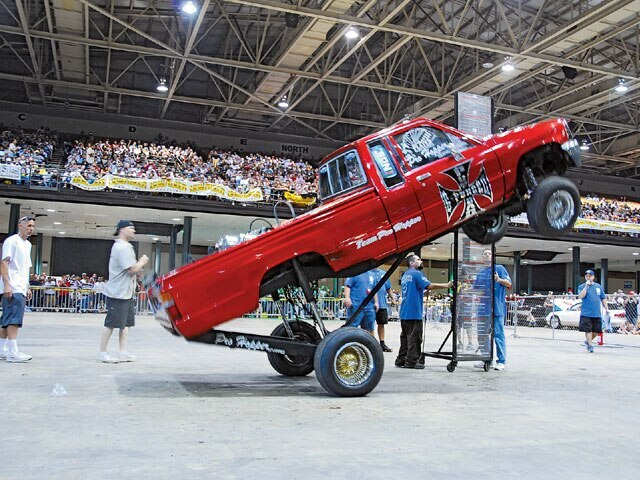 Michael Gonzalez of Bowtie Connection and his ’88 Mazda B2200 truck hit 79 inches for Second. The red and black Chevy Blazer of Erick Scott made its best effort but could only muster 30 inches. The Radical Hop had bumpers flying everywhere, which isn’t really a good thing in the pit. Only the highest score before the bumper comes off counts so any bumperless weight advantage is nullified. The candy red Buick Regal of William Sanchez and yellow Caddy of Romy Lima both lost their bumpers after the first couple of hits and hit 15 and 18 inches respectively. Some 34 inches separated Second and Third Place, and another 14 inches separated First and Second. Marcelino’s ’85 Pontiac Grand Prix hit 24 inches, Daniel’s Caddy hit 58 and Rob Robertson topped them all with 72 inches. With all of that out of the way, one of the things that most people love to see are the Dance categories. Nothing like watching a car dancing back and forth and being destroyed in the process. The Street Dance had five competitors vying for First Place. Travis Piper took a Third Place finish and Rodney Christensen Second. 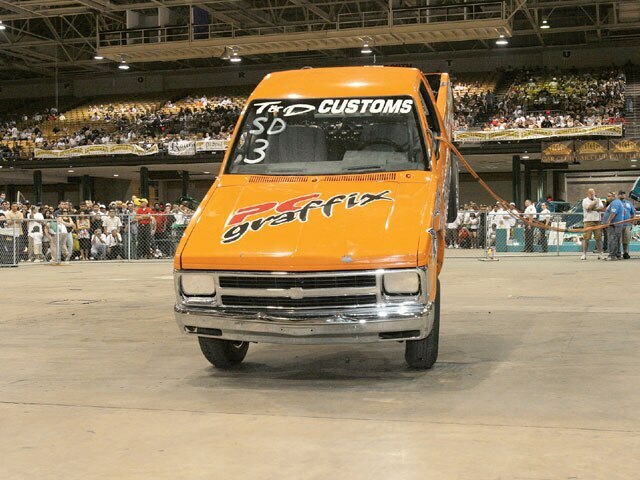 T&D Customs’ orange Chevy S-10 made its presence felt, hitting all of the required moves and then some rolling over on its side. This represented one of the best outings for the truck to date. The Radical Dance saw some equally interesting action, including seven-year-old competitor Keith “Lil’ Flip” Christensen. Under the watchful eye of his dad, Rodney, Lil’ Flip garnered a Third Place finish and the love of the crowd. Clint Perkins claimed Second Place. T&D Customs weathered a broken ball joint, smoke and fire to keep it moving to a First Place finish. The race for top honors is well under way and the battles will continue to heat up as we get closer to the grand finale in Las Vegas, Nevada, so stay tuned. This will certainly get interesting. 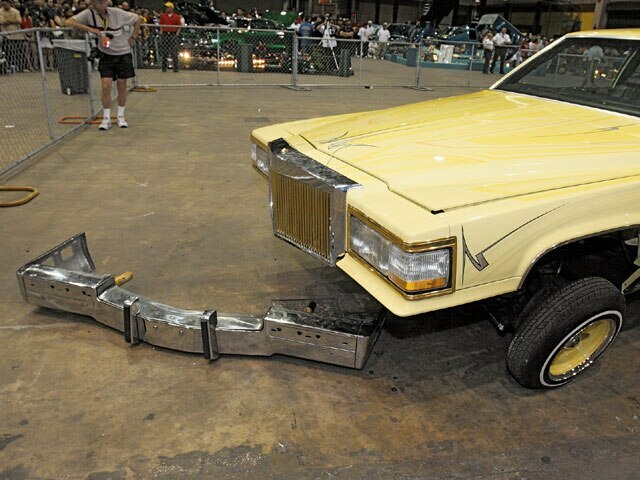 The object is to keep the bumper on the front of the car. 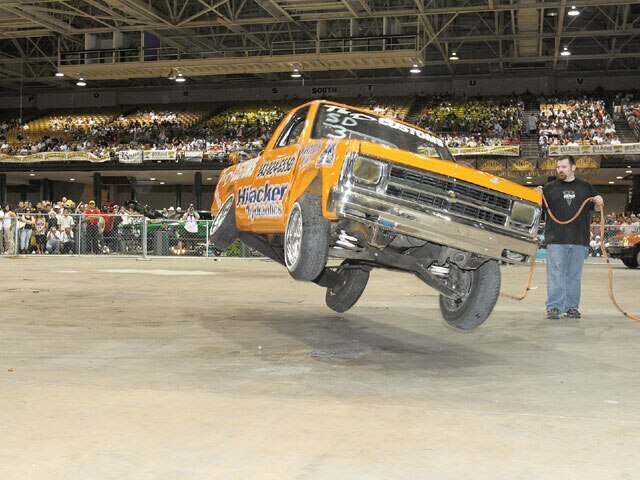 Bryan sharply focused on First Place and the Truck Hop record. Rob blurs out the Radical Hop competition.